So here it is, my omage to Tim Hortons maple donuts, beautifully soft, lightly spiced baked donuts topped with a maple glaze and chopped pecans! 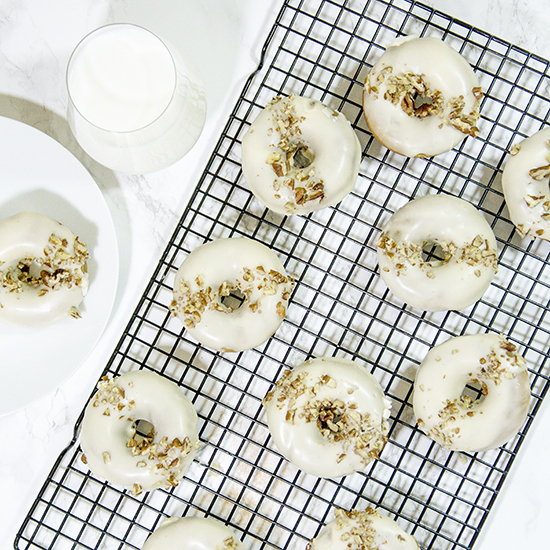 Absolute donut heaven, my maple pecan baked donuts! Preheat the oven to 180C. Spray a donut pan with non-stick cooking spray. In a medium mixing bowl add the flour, baking powder and spices, stir to combine. Set aside for later. Using an electric whisk or a stand alone mixer, beat the butter and brown sugar together until pale and creamy. This should take around 2 minutes. Add the eggs one at a time, beating well in between each. If the mixture looks like it will split add 1 tbsp of flour. Add the flour mixture to the bowl, using a low setting on your mixture to gently combine the ingredients. Split your batter evenly between the donut pans, if you only have one you will need to bake in batches. I find it easier to place the batter into a piping bag and fill the pan this way. Bake the donuts in the oven for 12-15 minutes. Once baked, let cool on a wire rack. In a large mixing bowl, add the icing sugar, milk, syrup and vanilla. Using your electric mixer whisk the mixture until it is thick. Then pop the bowl in the microwave and heat for 10 seconds. Beat again to remove any last lumps, it is ready when it is pourable but not too runny. Pop the bowl back into the microwave if it is still too thick. Dip each donut into the frosting and sprinkle with some chopped pecans and leave on a wire cooling rack for the frosting to harden. 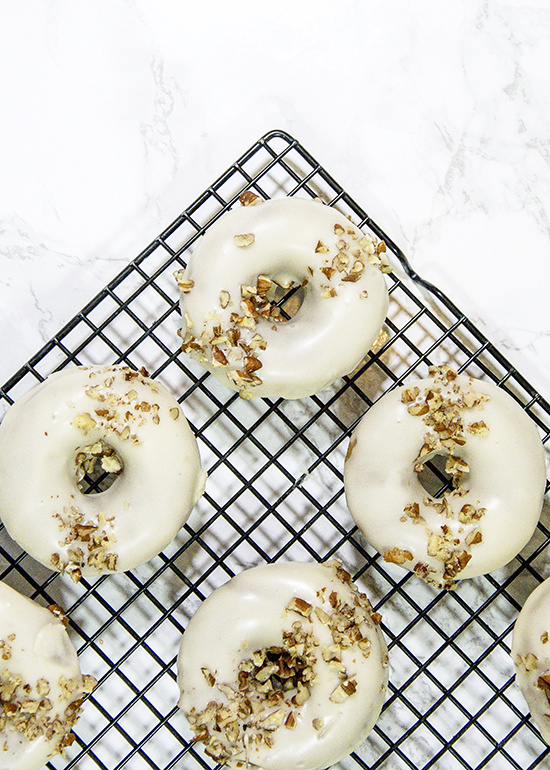 And there you have it, my maple pecan baked donuts recipe. I think the only way this recipe could be improved was if you sprinkles some chopped fried bacon over them!! If you give this recipe a go let me know how they turn out by tagging @whatseatingmanchester in your social media post! For more recipe inspiration check out my blog!